Hey howdy. Yeah another one of these.. 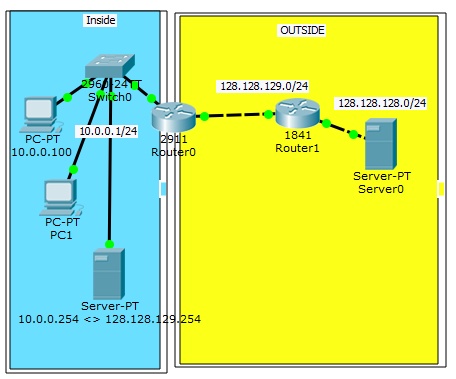 This is sort of a quick Natting guide for Cisco Routers. In the Cisco world you have 3 basic types of NAT, Static, Dynamic and Overload. Obviously these are more for me than you 😀 and you should look to cisco for documentation. Nat Overload – this you are familiar with, and the concept is easy, if you are given a small or a single public IP and you want to use NAT to allow access to the public internet from your local IPs that are not public addresses, you can generally accomplish this with NAT Overload. To accomplish this we start with identifying which interface is “inside” and which is “outside” on our router. The blue on the left is the “inside” (int gi0/0) and the right is considered “outside” (int gi0/1) and our router0 is considered your gateway to the internet. The other Router in play here is merely to simulate the internet. I’ve placed a webserver behind it, and that server is also running DNS. On Router 0 we need to configure the interfaces as Inside or Outside. Now we need to create a Standard Access List to specify which IP ranges we want to allow from the “inside”. We now use that access list with the following command to start the process. I used to be mystified by Access Lists on Cisco devices.. but I’m feeling pretty comfy with them now. Essentially an Access Lists is a Matching Filter List. It’s got two options, Permit and Deny. Here is my Lab. It’s actually similar to something I’m already working on but the names have been changed to protect the innocent. I have 3 VLANS, 85, 86 and 87. The vlans I do not want talking to each other, except for a single Server on 85 I want 86 to see. Access lists are actually really easy to set up. First you configure, then you apply to an interface, and you specify in what directions you want to match your traffic to the ACL, either in or out. 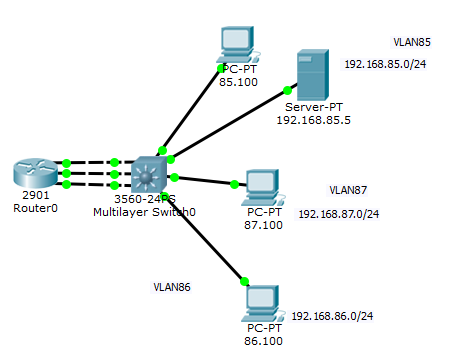 Lets start with our configuration with VLAN 86. I’ve made interfaces on the router for each vlan, and while i could have made a trunk and some sub interfaces I didn’t bother here, since it’s a lab. I’ve made some vlans on the switch and have applied static IPs to the various workstations and a single server. The goal is to not allow traffic from any vlan to any other vlan, except for a single server. ACL’s are processed from the top down, and once packets meet any criteria as they are processed thru the list they are sent along according to the rule they matched. So as an example. If sequence 5 tells the router to allow packets from 192.168.1.20 to reach network 192.168.20.0/24 then those are allowed if the next sequence tells it to deny 192.168.1.0/24 from 192.168.20.0/24 which would match up with the rest of the source IPs on that subnet. Also.. if you had those sequences switched this rule would be ignored. To create an access list first you configure and then you apply. Lets start with VLAN 87. We simply want to block any IP from 192.168.87.0/24 from reaching any 192.168.86.0 address or 192.168.89.0 address. on our cli we need to start with giving the acl a name, and specifying that it’s an extended list. Note, if you start putting in rules with no sequence number, you will simply start at 10 and then increment to the next 10, so 10, 20, so on. However, if you specify the sequence number first, you can choose where your entry lands on your list. I personally like separating them to give me room for later changes. Sequence# – the numbers are always observed as 10, 20, 30 and so one in increments of 10, but if you put one in as 31 then it will become 40 and 40 will move down. protocol, ip means everything.. otherwise port number or name if it’s recognized. It’s also work noting that the item that looks like a subnet there is actually wildcard bits, which.. is a curve, but you will learn fast, essentially if it changes how many bits can change. Note that I’ve placed an “any any” at the end. If your access list is only made of denials, it will simply deny everything because of the explicit and hidden “deny deny” that is at the end. If you only need to allow certain address then please of course do that. Now we need to apply the ACL’s to our interfaces. You have to specify whether or not this filter should be applied on an interface on traffic that the router is sending to (out) or receiving from (in) other devices.